Blackburn Cathedral as the Cathedral of Lancashire stands in the heart of multicultural East Lancashire. It has been a cathedral since 1926. Its foundation as a parish church dates back to 596 and the present building is a much extended Georgian Gothic Parish Church of 1826. The new Cathedral Court was opened in 2016 and part of the project included the first cloisters to be built at a UK cathedral for over 500 years. The development includes housing for the cathedral clergy and staff as well as a hall of residence for organ and choral scholars. It also includes new public gardens, a library, conference facilities, offices, parking and the new Temple Gallery that links the original cathedral building to the new cloisters. The building is also home to the new Café Northcote which greatly enhances the hospitality that the cathedral is able to offer visitors and tourists. The development has also created the opportunity to create new public areas and gardens that now link the cathedral directly with a new Cathedral Square, with offices, restaurants and a hotel. The cathedral has a small but impressive collection of 20th and 21st-century modern art. Before my commission in 2005, the most recent commission was the huge 8m in diameter external sculpture on the east end of the Cathedral completed in 2000 by Mark Jalland entitled, “The Healing of the Nations.” The Dean and Chapter chose this theme in the hope it would resonate not only with the Christian community but also with those of other faiths. 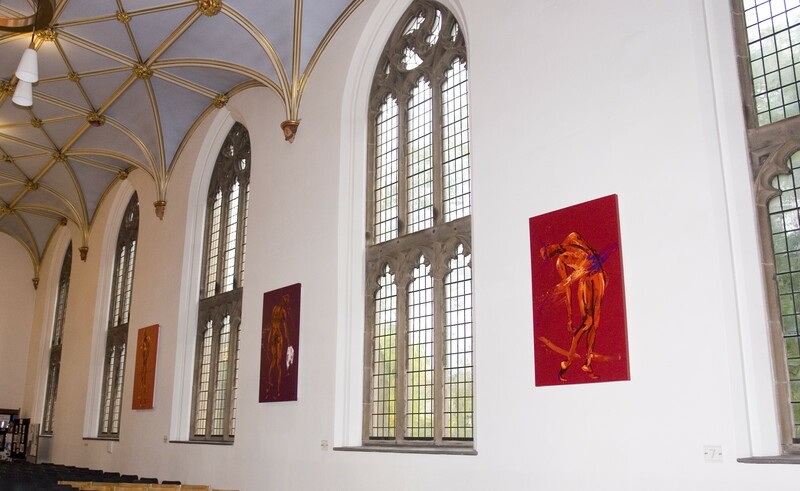 In reflecting on how they moved on and enhanced the cathedral with additional art, the Dean and Chapter came into contact with me when acting as host to my Phoenix paintings in February 2003. On seeing these pieces, they were convinced that a major work by myself on a theme set by the Chapter would be a great asset to the task the Chapter has set itself, namely to open the cathedral to as wide a cross-section of the community as possible and for it to be a focus of unity to all people of faith. They settled on The Stations of the Cross despite being an Anglican cathedral. I was allowed the freedom and creativity to paint the Stations of the Cross for permanent display in Blackburn Cathedral. Now known as The Journey, these paintings are very far removed from the traditional Stations of the Cross that one finds in other (mainly Roman Catholic) churches and cathedrals. They are life-size, they contain one figure only and do not have any images of the cross in them! For me imaging the body of Christ in a series of fifteen life-size permanent paintings was an extraordinary privilege but carried with it a huge artistic responsibility. To display one’s religious artwork in the context of a sacred space inevitably invites the viewer into a deeper spiritual experience of that art, compared to it being viewed in a gallery or museum. Artists creating Christian images for installations in public art galleries do not have such constraints, because they do not have the same responsibilities when they are creating images of Christ. Such paintings are not to be seen primarily by the worshipping community and do not necessarily aim to produce a faith response. Cathedrals are living spaces and as an artist there are pitfalls and risks when one enters into conversation with them, for one’s work will encounter the tides of history and the magnitude of the human spiritual quest. The Stations will be of national significance and compliment the already impressive stock of modern art at the Cathedral. They will assist the Cathedral in its missionary mandate to tell the story of Christ’s last few hours to a puzzled and agnostic generation. These ‘Stations’ will engage with people where they are, in all the conflicts and sorrows which life brings in the 21st century. As the Venerable Bede argued in the 8th century, religious art fulfils both an instructive function and a recollective function; it is there to teach people and to help them remember what they have learnt. and thirdly that his deeds are more likely to be remembered if they are seen rather than just heard. Thus a depiction of the suffering Christ served as a reminder of the sacrifice he made for the sake of humanity. The feelings of gratitude, pity or pious remorse it inspired in the devout were intended to deepen their love of God. In other words, looking upon a representation of Christ is meant ultimately to lead to the imitation of Christ. Hence religious faith becomes a possible result of engaging with the painting. This is a formidable creative challenge and a solemn responsibility, but one I have shared with countless artists throughout the centuries. I, like them, have sought to produce paintings that are inherently devotional, enabling people to encounter at a personal and spiritual level the Christ that the images portray. With such intentions in mind, creative boundaries are inescapable for the artist commissioned to produce art for permanent display in a Christian worshipping space and especially cathedrals. 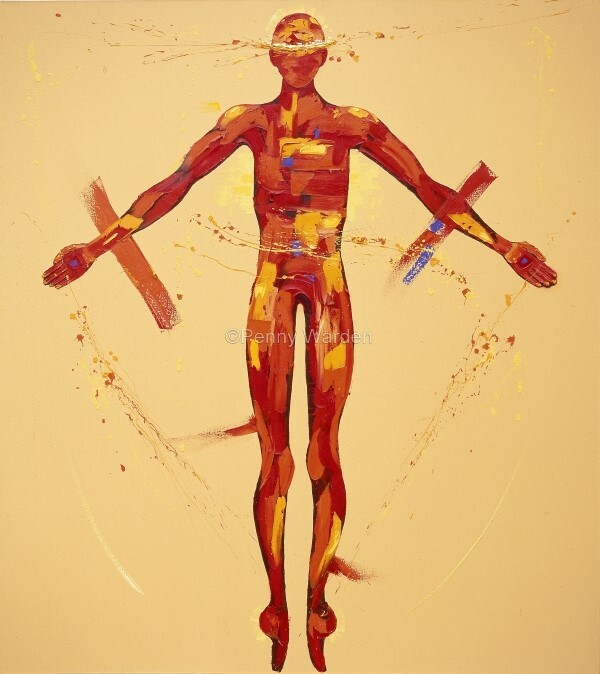 Perhaps the central challenge for the artist in imaging the body of Christ is the problem of representing the dual natures of the doctrine of the incarnation – that is, Jesus believed to be fully human and fully divine. How does one depict Christ's divinity at the same time as depicting his humanity? From the beginning of the Christian era this has been the problem for artists trying to represent Jesus the Christ. At the other extreme was the attempt to ban any pictorial representations of Jesus, because it was believed to be simply impossible to accurately represent Christ in a painting. This is because it was thought that the painting could only portray his human nature and not his divinity. This prohibition most famously reached its height in the iconoclast of the 8th and 9th centuries. This widespread destruction of all icons representing Jesus was largely motivated by a literal interpretation of the prohibition in the Ten Commandments, not to make any ‘graven images’ of God. This artistic tension, trying to represent Jesus’ humanity as well as his divinity, is still a central difficulty for artists today. For example, some artists when painting the Stations of the Cross use completely abstract images, not depicting a body at all, such as Barnett Newman’s paintings. Many artists go to the other extreme and use very realistic human representation such as Chris Golan’s contemporary stations, using the faces of his daughter for Mary and his son for Jesus. However, in my quest to portray Christ's humanity and divinity, I have tried to avoid either of these extremes, neither complete abstraction nor total realism. How then could I use my creativity to express the inexpressible? 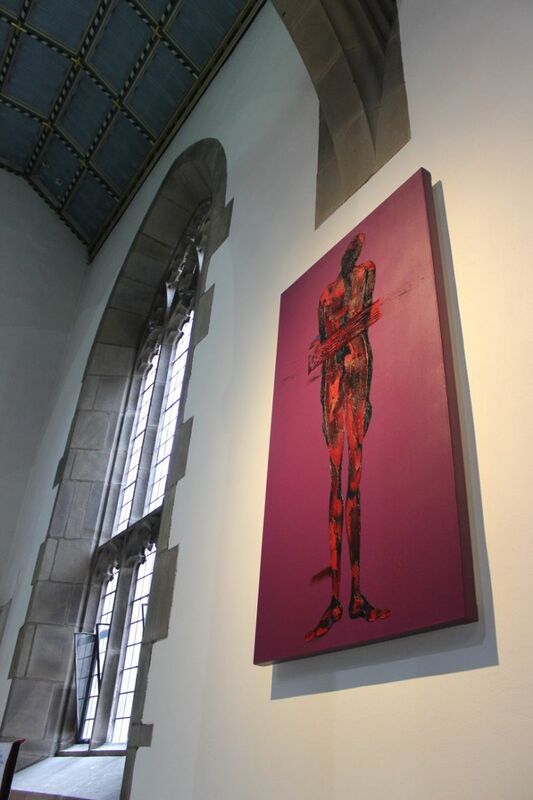 How can the visitor to Blackburn Cathedral perceive an elusive God through my paintings? Another challenge was the size and shape of my canvas. Since the nave had no stained-glass windows, my paintings needed to compensate for this and therefore be of uniform size and shape. I decided on a 3ft wide x 6ft tall canvas for the eight paintings that would be hung both sides of the nave. This severely restricted me artistically as to how I could represent a figure falling or a figure carrying a cross! I would have to capture the anguish and emotion of Christ’s passion within the figure through the shape and stance of the body. There is then a recognizable human form in each of my paintings of the Stations of the Cross. This is deliberate so as to point to the essential mystery of the incarnation – namely that God is revealed to humankind in human form. Most of the figures are also slightly androgynous – other than Mary and Veronica – so as to convey that both men and woman are created in the image of God. At the same time I have deliberately avoided painting a realistic face of Christ. I do not want to limit the viewer by portraying what Christ may have looked like. Rather I want the viewer to use their own imagination. 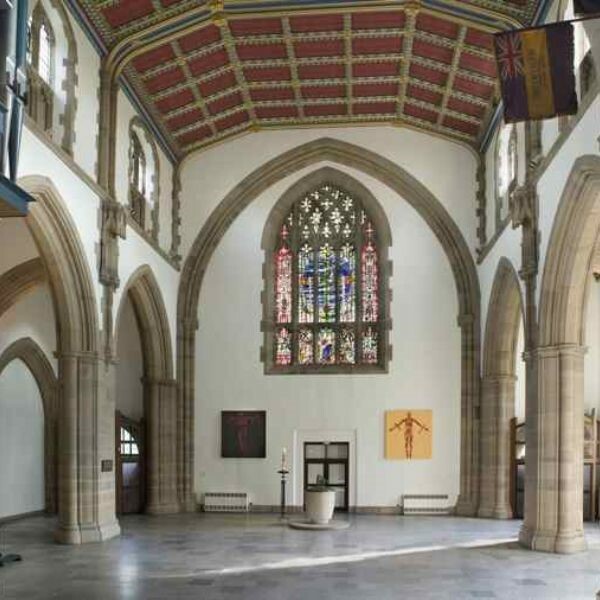 The Journey at Blackburn Cathedral consists of 15 6ft oil paintings which hang throughout the cathedral to form a ‘walking route’ – a ‘journey’ – to follow the way of the cross with Christ on his final journey. 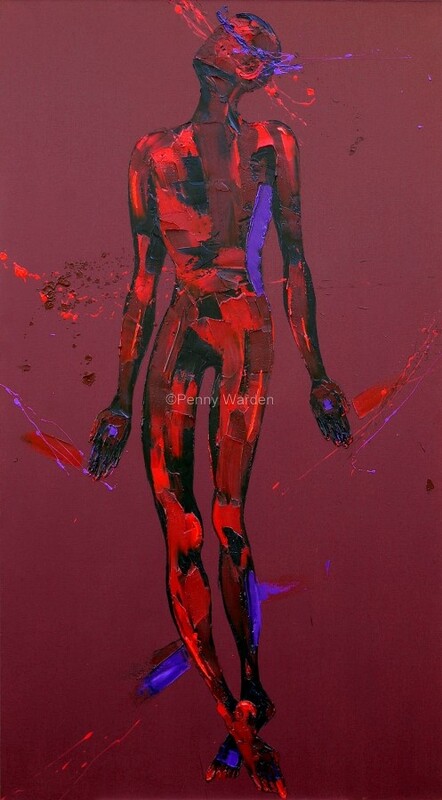 Each painting, depicting one lonely figure, has been painted in such a way to challenge and speak to all who view it. We are not just observers of the journey of Christ rather we use his journey to help us to understand our journey through life. Canon Chris Chivers said, "When you have walked the journey in Blackburn Cathedral you will leave having discovered a little more of what it means to be human in an age where inhumanity must not be allowed to win." My aim in painting these Stations was to translate the familiar images of Christ’s final journey of trial, condemnation and eventual crucifixion into a new arrangement of colour and form. I reduced the images to a minimum, to one lone, life-size and faceless figure, so that the viewer – instead of just observing a past event of someone else’s story – could enter instead into a dialogue with this figure. Whilst the stations are rooted in an historical event they speak universally of the human condition. ‘The Journey’ of Christ to his inevitable death is symbolic of all who suffer. We can paint our own faces on these suffering figures, making the journey of Christ through his suffering to his death and subsequent resurrection our own journey. The vibrant colours of each station have been chosen carefully depending on what they were depicting and also the physical location of the painting in the cathedral. The first station is predominantly purple suggesting the royalty of Christ and the robe given to him by his accusers. 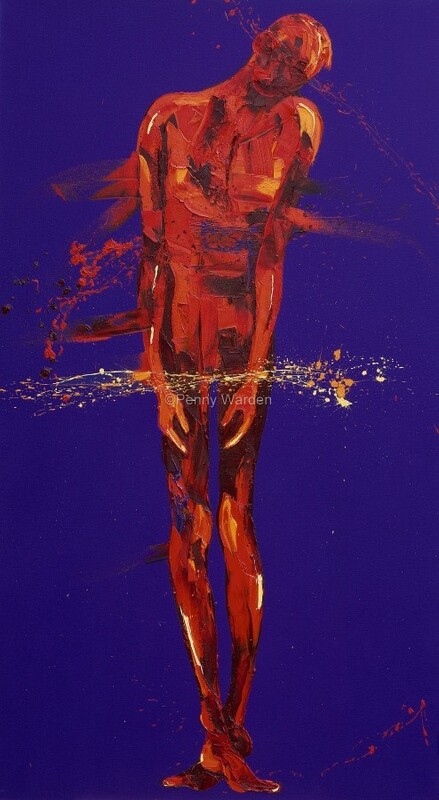 This theme of purple carries on through each painting mainly in a crown of thorns and in Christ’s wounds. Please visit www.thejourney.me.uk for more info or follow the link from Blackburn Cathedral website. Since Blackburn I have completed several more commissions for churches and chapels. In 2010 to celebrate 25 years of hospice care in Blackpool, Trinity Hospice commissioned me to paint a sequence of paintings to hang in the Hospice Chapel. The commission specified that the paintings must reflect the mission statement of the hospice: "enabling compassionate care on the journey to the end of life" and represent the essence of hospice care in terms of helping individuals find a new way to be with whatever they were facing. In approaching this commission I asked the following questions. What do the staff and carers do in this hospice? What are the patients and loved ones feeling and thinking? What is it to be a human being? I decided to choose the theme of the dance, inspired by the well-known hymn Lord of the Dance. The hymn contains the famous words of hope, I am the life that will never, never die. It seems to me that this was an appropriate theme, and also resonated with the famous passage from the Old Testament in the book of Ecclesiastes, which is often read out at funerals and elsewhere: There is a time to be born and a time to die, a time to mourn and a time to dance. More about The Dance at Trinity Hospice can be seen on the BBC website. Born in 1956, I began to paint at a very early age and was highly commended for my work by the Royal Drawing Society when only 12 years old. Despite coming top of my class in art for most of my school years and despite the protests of my art teachers I did not continue in my art studies after leaving school. Instead I pursued various ‘safer’ careers in the city of London and finally in teaching after graduating in 1984 with a degree in Theology. However, I continued to paint whilst being Head of Religious Studies and raising two children. Finally I gave up teaching in the late 1990’s to follow my passion. I became a fulltime artist in 2001 at the age of 45 (it’s never too late!). 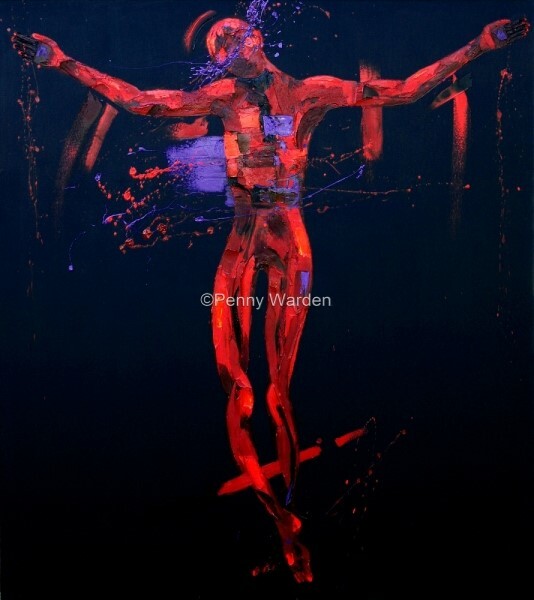 Alongside commercial work for galleries, which you can view on www.pennywarden.com, I had a solo tour of over ten cathedrals with my series of crucifixion paintings called ‘The Phoenix Paintings’. My first religious commission was for St. John’s Church Waterloo London. My work has appeared in many high-profile locations and galleries across London, the UK and abroad. My paintings are created in a radical and exciting way, working whenever possible with a maximum of spontaneity, with vibrant colours splashed and thrown in an arbitrary, though deliberate manner. The resulting figures are full of movement, emotion and drama. My paintings have featured in a number of national and international magazines and publications. I have been a speaker at numerous conferences and have been part of several consultation groups at Windsor Castle on ‘Human Creativity in the Arts’. In March this year I will be giving the ITIA Research Seminar at St Andrews University.